An experimental investigation was carried out to determine the dynamic Poisson's ratio and modulus of elasticity of pozzolana Portland cement concrete. Large numbers of concrete cubes were prepared and tested in the laboratory for investigation. The destructive and non-destructive tests were conducted on concrete cubes at different ages. 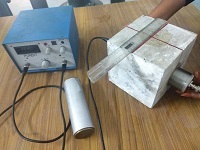 The destructive test was conducted to obtain the compressive strength of concrete cubes. Ultrasonic pulse velocity of cube specimens was derived according to IS 13311 (Part 1) and the transit time of longitudinal and shear waves transmission was recorded. The recorded values are used to determine the dynamic values of Poisson's ratio and elastic modulus of concretes. Based on experimentally obtained data and analysis, a few relationships are proposed to correlate the water/cement ratio, Poisson's ratio, elastic moduli and compressive strength of concretes. Several interesting findings are observed from the correlations of the coefficients while analyzed by regression analysis. This study helps to determine the static properties of concrete from the dynamic ones. Plain and reinforced concrete-code of practice, Bureau of Indian Standards, IS 456, 2000. R. N. Swamy, “Dynamic Poisson’s ratio of Portland cement paste, mortar and concrete,” Cement and Concrete Research, vol. 1, no. 5, pp. 559-583, September 1971. Non-destructive testing of concrete-methods of test, Bureau of Indian Standards, IS 13311 (Part 1), 1992. J. Carette and S. Staquet, “Monitoring the setting process of mortars by ultrasonic P and S-wave transmission velocity measurement,” Construction and Building Materials, vol. 94, pp. 196-208, October 2015. Y. Lin, C. P. Lai, and T. Yen, “Prediction of ultrasonic pulse velocity (UPV) in concrete,” ACI Materials Journal, vol. 100, no. 1, pp. 21-28, January-February 2003. F. D. Lydon and R. V. Balendran, “Some observations on elastic properties of plain concrete,” Cement and Concrete Research, vol. 16, no. 3, pp. 314-324, May 1986. L. W. Teller, “Elastic properties, in significance of tests and properties of concrete and concrete aggregates,” ASTM Special Technical Publication, No. 169, pp. 94-103, 1956. J. R. Leslie and W. J. Cheesman, “An ultrasonic method of studying deterioration and cracking in concrete structures,” American Concrete Institute Proceedings, vol. 46, no. 9, pp. 17-36, September 1949. Building code requirements for structural concrete, ACI 318-14, ACI Standard, September 2014. M. Kakizaki, H. Edahiro, T. Tochigi, and T. Niki, “Effect of mixing method on mechanical properties and pore structure of ultra high-strength concrete,” ACI Special Publication, vol. 132, pp. 997-1016, May 1992. T. Takabayashi, “Comparison of dynamic Young’s modulus and static Young’s modulus of concrete,” RILEM International Symposium on Non-destructive Testing of Materials and Structures, vol. 1, January 1954, pp. 34-44. Design of concrete structures, General rules and rules for buildings, BS EN 1992-1-1:2004, December 2004. R. N. Swamy and A. K. Bandyopadhyay, “The elastic properties of structural lightweight concrete,” Proceedings of the Institution of Civil Engineers, vol. 59, no. 3, pp. 381-394, September 1975. S. Popovics, “Verification of relationships between mechanical properties of concrete-like materials,” Materials and Structures, vol. 8, no. 3, pp. 183-191, May 1975. Xiaobin Lu, Qichen Sun, Wei Feng, and Juntao Tian, “Evaluation of dynamic modulus of elasticity of concrete using impact-echo method,” Construction and Building Materials, vol. 47, pp. 231-239, October 2013. M. Nematzadeh and M. Naghipour, “Compressive strength and modulus of elasticity of freshly compressed concrete,” Construction and Building Materials, vol. 34, pp. 476-485, September 2012. Klara Krizova and Rudolf Hela, “Selected technological factors influencing the modulus of elasticity of concrete,” International Journal of Civil and Environmental Engineering, vol. 8, no. 6, pp 593-595, 2014. Krystian Jurowski and Stefania Grzeszczyk, “The influence of concrete composition on Young's modulus,” Procedia Engineering, vol. 108, pp. 584-591, 2015. P. S. Kulkarni, A. Ghatge, O. Kank, A. Nair, and R. Aswar, “Experimental investigation on modulus of elasticity of recycled aggregate concrete,” International Journal of Earth Sciences and Engineering, vol. 9, no. 3, pp. 415-419, June 2016. Byung Jae Lee, Seong-Hoon Kee, Taekeun Oh, and Yun-Yong Kim, “Evaluating the dynamic elastic modulus of concrete using shear-wave velocity measurements,” Advances in Materials Science and Engineering, pp. 1-13, July 2017. Portland pozzolana cement-specification, Bureau of Indian Standards, IS 1489 (Part 1), 2015. Coarse and fine aggregate for concrete-specification, Bureau of Indian Standards, IS 383, 2016. Concrete mix proportioning-guidelines, Bureau of Indian Standards, IS 10262, 2009. Compression testing machine used for testing of concrete and mortar-requirements, Bureau of Indian Standards, IS 14858, 2000. R. Jones, Non-destructive testing of concrete, 1st ed. London: Cambridge University Press, 1962.
fib model code 2010, CEB-FIP manual, vol. 2, April 2012. J. C. Simmons, “Poisson's ratio of concrete: a comparison of dynamic and static measurements,” Magazine of Concrete Research, vol. 7, no. 21, pp. 61-68, July 1955. H. E. Krenchel, “Structure concrete and its behavior under Load,” Proc. International Conference, September 1965, pp. 160. A. M. Neville, Properties of concrete, 3rd ed. England: Longman Scientific and Technical, Essex, 2002. P. K. Mehta and P. J. M. Monteiro, Concrete microstructure, properties, and materials, 3rd ed. New York: McGraw-Hill, 2006.